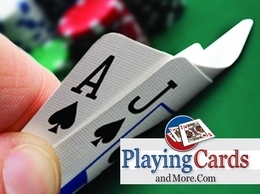 Premiere e-commerce site for quality playing cards for Poker, Bridge, Canasta, Pinochle & Rummy. 100% Plastic Cards in all styles & colors. Worldwide shipping. 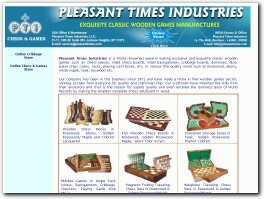 Pleasant Times Industries produce classic wooden games such as Chess pieces, inlaid chess boards, inlaid backgammon, cribbage boards, dominoes, dice, poker chips cases, racks, playing card boxes, etc. in various fine quality wood such as Rosewood, ebony, white maple, teak, boxwood etc. We are dedicated to crafting the finest Staunton style chess pieces for anyone looking for quality and distinction in their living and playing environment. 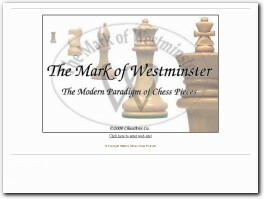 The Mark of Westminster®represents the best chess sets you can buy today. Fun, laugh, education and better than poker ! Discover Who's Bluffing? Celebrate the moments with Who’s Bluffing?® and be a part of our community of well-cultured bluffers! Check out how fun playing Who’s Bluffing?® can be! Exciting, educational, and unpredictable, Who’s Bluffing?® is full-on fun for friends and family. Board Games are something kids will always have a great time with and to make this a certainty. Toy Shop with wide range of board games and toys that are proven to be a ton of fun with some of the most popular cartoon characters that your kids love. I love stuff and have opinions. I love to review stuff and share those opinions, especially about board games. Our first available game is Hibernation, a bear themed deck building card game. Look forward to many other great games with a wide array of mechanics, ​rules and unique circumstances for victory! We have world’s best board & tabletop games for all age groups at our Games store in KC, MO. Try before you buy. You can sell old games. Discounts available! Scrooge The Board Game is the next family classic board game experience. For families and fun-loving adults. Animal Ailments - The Miming Party Game! Animal Ailments is here! The wild new family game. Will you be... “...a tiger that's scared of mice? !” “...a sleepwalking kangaroo? !” “...a t-rex with bad breath? !” Outrageous and hilarious miming combinations! Publishing fun and exciting board games since 2000.